We're celebrating 10 years of Sea Tea Improv! Until the end of April, buy online with promotional code APRILFOOLS to get 10% off every show, workshop & class. Improv is for everyone. Whether you’ve got dreams of being a comedian,you want to strengthen your public speaking skills, or you’re just sick of your board game collection, improv can help! In this class, students will learn the basic techniques and games that professional improvisers and comedy writers use to collaboratively discover fun ideas, characters, and scenes. You’ll work in teams, so you’ll never be left hanging alone. Our number one rule is “make your partner look good,” so come try improv in a supportive, no-pressure environment, and learn from a professional improviser! Learn to create completely improvised comedy scenes and characters by working with others! Students in this class will learn to really listen to their scene partners, add interesting specifics & details, and progress & expand improvised scenes. We’ll use short, fast-paced improv games to learn to act quickly and spend less time worrying about making the perfect move. Invent and inspire rich and consistent characters, and learn to create a playable environment with just miming. This course ends in a share performance for an invited audience. Prerequisites: None, though students with no performance experience may prefer to take one of our 4-week Intro to Improv classes before taking Improv 101. Note: Previously, two courses were offered at the 100 level: “Improv 101 – The Scene” and “Improv 102 – The Character”. These have been combined. Students will learn how to identify, explore, and manipulate the game of the scene by working on both basic longform scenes and fast-paced short-form games. Players will understand how to find and play patterns within the game, manipulate and heighten the suggestion of the game and to play to the top of their intelligence. This course ends in a share performance for an invited audience. Prerequisites: Completion of Improv 101 or Improv 102. In this introduction to longform improvisation, students will explore longform openers, developing premise, and moving beyond initial scenes into second beats. Players will learn to use techniques such as tag outs, bending the space, walk-ons, advancements, callbacks, editing, group games and scene painting, all within the context of working as a team. The course ends in a share performance for an invited audience. In “The Set List,” students will learn how to play the games you know (and many you don’t) to the very best of your ability. Root out the games within the game, and play to the top of your intelligence no matter if you’re speaking in gibberish, mime, poorly translated Russian, or alphabetical order. We’ll apply advanced scenework techniques to simple games to find the perfect blend of short-form styles and practical theatrical concerns (is there conflict? How’s your stage presence looking?). Make bolder choices, do better scenes, and walk away with a greater understanding of how to have the most fun while using the best part of your brain. Prerequisites: Varies, but typically requires completion of Improv 301 and/or Improv 302, and/or instructor approval. 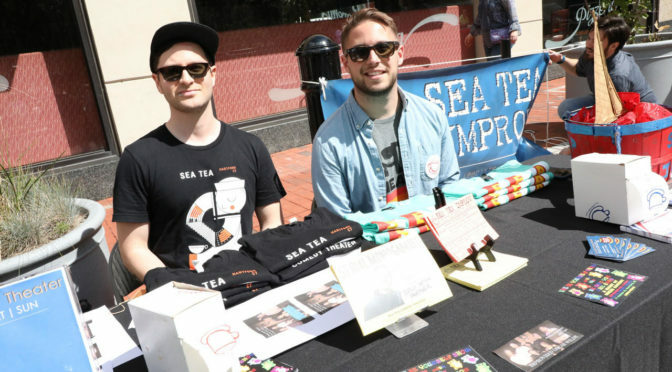 "Hartford has had a blossoming improv community over the last few years, with the Sea Tea Comedy Theater packing audiences into an intimate, scrappy 80-seat house..."
"Sea Tea Improv has been very consciously building a community and building a business in a way that serves a model for not just comedy troupes, but for many arts organizations." "The space is lovely. There's some exposed brick, some paneled wood, some carpeting — a little of everything, just like the entertainment." "The company works with business professionals on everything from how to better listen to customers, to teaching managers how to allow their employees to finish sentences before interrupting." Supported in part by the Greater Hartford Arts Council’s United Arts Campaign with major support from the Hartford Foundation for Public Giving.